Decorative and Faux tools - Specialty brushes and equiptment. Color Washing - Learn how! This decorative effect creates the appearance of floating color. Soft and watery, or bold and striking. The color density varies over the surface and creates appearances from parchment to the softness of an evening sky or the deepness of watery depths. A subtle finish, with little texture, it is an ideal effect to create mood in a room, background ambience. 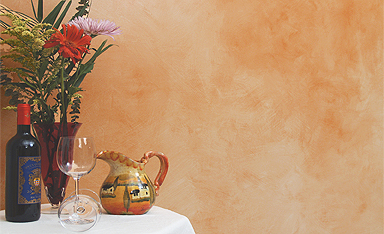 When using earth tones the color wash can have a slightly aged appearance and is ideal for irregular wall surfaces. 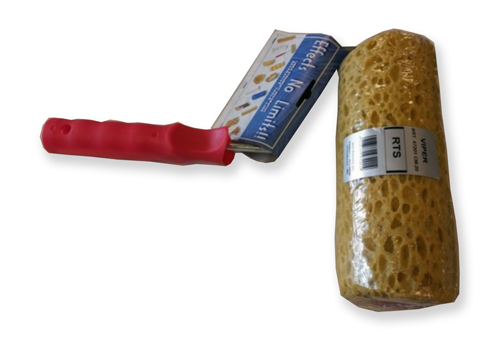 Create a variety of sponge effects with this great sponge roller tool. Experiment with multi-colored patterns. Create linear sponge effects or random patterns. This easy to use tool puts creativity in your hands. Increases efficiency and quick clean up. Use oiver and over again. © Copyright 2019. Images of products by artSparx.com.